Liposonix is the noninvasive, nonsurgical “fat-melting” procedure that promises one size less with one treatment. 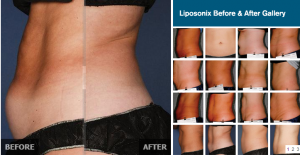 Liposonix has unique body contouring capabilities by getting rid of fat. The targeted technology can be customized to provide results in a number of areas in a single treatment for as large or small an area that you want to address. Few of us are in love with our shape and most of us have a little bit of extra “size” we’d like to get rid of. New technology offers interesting options that bypass surgery, diet and exercise for the busy who have little time to take off or even invest in daily gym routines. Ultrasound, when highly focused, causes a very quick rise in temperature of the tissue that is targeted. This process, termed HIFU which stands for High Intensity Focused Ultrasound, is programmed to heat the tissue at a depth of 1.3 cm. This is the level where fat tissue is found in the abdomen and flanks. The heated fat begins a process of “melting”. The body’s natural clean up system begins its job of engulfing and clearing the treated adipose (fat) cells and in 8 to 12 weeks they are eliminated by the body. Only fat is destroyed. The other tissues are undamaged. Patients come in all shapes and sizes, and so does their fat. Other non-invasive body contouring devices are a little more limited in their ability to treat certain areas of fat and may require several hours and/or multiple treatment sessions to adequately address problem areas. The Liposonix system allows control over precisely how and where energy is delivered, for a truly customized treatment in a single one-hour session. Most truly effective procedures that are heat-based create some level of discomfort. Liposonix is no exception in this area. However, any patient who is anxious or desires pain prevention medication can simply discuss this option with Dr. Pilest during the consultation. This is one treatment that honestly is “no pain, no gain”. As much as we would like to offer a pain free option, some treatments will ONLY deliver results if the energy levels are high enough to complete the desired action. Pain management is not a problem and can be implemented for this and any other procedure that calls for high energies. Side Effects and Patient Comfort: Discomfort during treatment is generally described as pain, cold, prickling, tingling, or warmth. Post-treatment: Side effects include bruising, redness, and swelling, also generally described as mild. In this case, bruising is a desirable side effect because it is an indication that the treatment is working. The use of any patient comfort technique during treatment with the Liposonix system is at the physician’s discretion, based on an objective medical assessment of each individual patient. If you would like to learn more about Liposonix, please call our office at 949-727-3800 today to schedule a consultation or fill out the form on this page and one of our trusted staff members will reach out to you promptly.